Birch Elfa Decor Shelves is rated 4.9 out of 5 by 65. Are these shelves made of solid wood? Thank you. Our elfa d&eacute;cor Shelves are crafted with exceptionally strong honeycomb construction and a wood veneer finish. Are the Elfa Sand and Elfa birch colors close the same color? I want to use the birch decor shelves on one wall of a walk in closet and the sand on another so they won't be touching, do they look close enough? Our Birch elfa d&eacute;cor Shelves are actual wood veneer while our elfa Sand Melamine Solid Shelves are a man-made plastic laminate over MDF. The finishes are not the same, but they do coordinate. When used on separate walls of the same space, the compatibility of the two finishes is simply a matter of personal preference and taste. For further assistance, please contact us at 1-888-CONTAIN (266-8246). What are the wood shelves finished with and what is the honeycomb made from? Are these no VOC products? 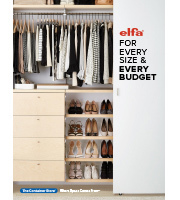 Does Elfa have environmental certifications? elfa d&eacute;cor shelves are made with a solid Birch frame with a honeycomb interior. The honeycomb is made from a corrugated material. They have a birch veneer on top and bottom that is stained with a water based lacquer. Gap between shelf and wall? How wide is the gap between the back of the shelf and the wall once it&rsquo;s installed? I&rsquo;d like to run an extension cord behind the shelf. Do these shelves require screws or the connector to attach to the brackets? No extra hardware is required to attach our Elfa Decor Shelves to the appropriate Elfa Ventilated Wire Shelf Brackets. The Elfa Shelf Screws and Elfa Connectors you reference are for use with our Melamine Shelves.